Archive for XR6 (Perseus V) high power booster. Nesaru’s next flight is set to test a new rocket to ground real-time telemetry system. Nesaru will be reporting its altitude, and systems status to a ground base station during her entire launch through landing phases of flight. The goal is to test & develop an in-flight telemetry system for future rocket projects. The tests will progress in stages to lead to the development of a more capable (advanced) sytem to be used in the upcoming XR-10L rocket due to make its maiden launch by 2016. Telemetry transmitter installed, time to put Nesaru back together! 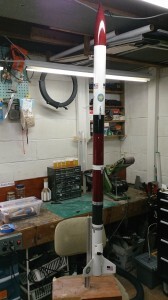 Nesaru stack fully assembled. Ground testing of its new radio telemetry link to begin soon, then it’s on to mission NLS-007! Ground testing of the new radio telemetry link will begin in a few days. I’ll keep you posted on the test results, and the announcement of the launch date for mission NLS-007! 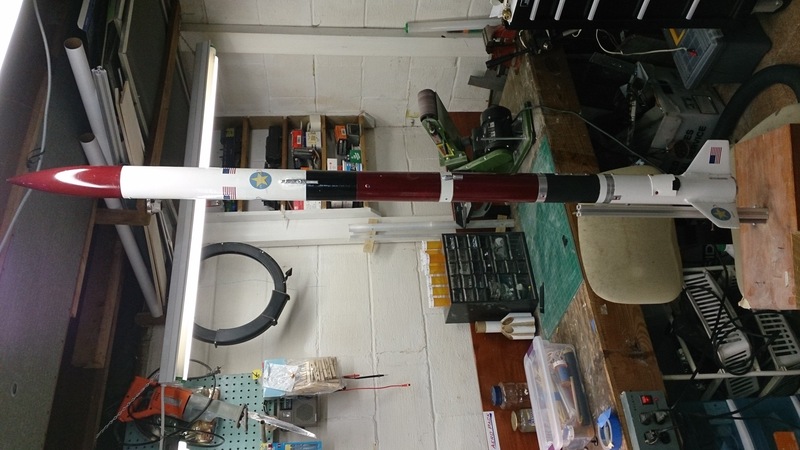 Today’s post is a dual subject (rocket) post, and it kind of has to be. Enjoy the info! I finally inally got around to looking closer at the flight data from Nesaru’s first two flights from around a year ago, and was able to get very accurate data on its actual velocity on those flights. Back of the napkin calculations at the time with a cursory glance at the data showed flight #1 (NLS-001) achieving a peak velocity of mach .75. Official number? : Mach .76! (578 MPH). Flight #2 (NLS-002): Mach .78 (593 MPH). Between flight #1 and #2, a number of changes were made to the design as a result of an unsuccessful first flight, resulting in some weight reductions. Flight #2 was also plagued with a problem. Both missions resulted in a “hard landing”, mission NLS-001 being the worst of them. Nesaru bears some of the scars from those two flights! Since then, Nesaru has flown missions NLS-003 to 006 on lower impulse motors so it’s average speed has been around 450 MPH. It wasn’t my intention to fly in the trans-sonic region of flight. The motor I had at the time (CTI-H255 wt) is a very punchy motor, and I knew the design was tough enough to take such a motor, but the XR6 wasn’t designed with “flying at or near Mach velocities” in mind, so it is interesting to see that it handled itself OK at velocities very close to Mach1. I’m reviewing this data closely at this data, as the behavior of the XR6 under the stresses of trans-sonic flight were an important factor in the final design decisions for Comanche XR9C. Being a full pound lighter than Nesaru XR6, Comanche stands an even greater chance of breaking Mach 1, though I will not try to go for that (intentionally) right away. Comanche is set for a second attempt at a maiden launch December 28, 2013 — weather permitting. So far, weather forecasts place launch conditions are within an acceptable range for launch. The window between the current weather front, and the next one leaves a 1 day window of opportunity (Dec 28th). If the front moves faster or slower then predicted, it will cause another scrub of the maiden launch attempt. XR6 (Nesaru) Mission 6 on-board video with narration! (Cuyahoga Falls, OH – December 1, 2013) I have edited the video from Friday’s Nesaru mission. This time, I have added narration. I correlate the data from the flight computer with the events in the video, and explain what is happening. 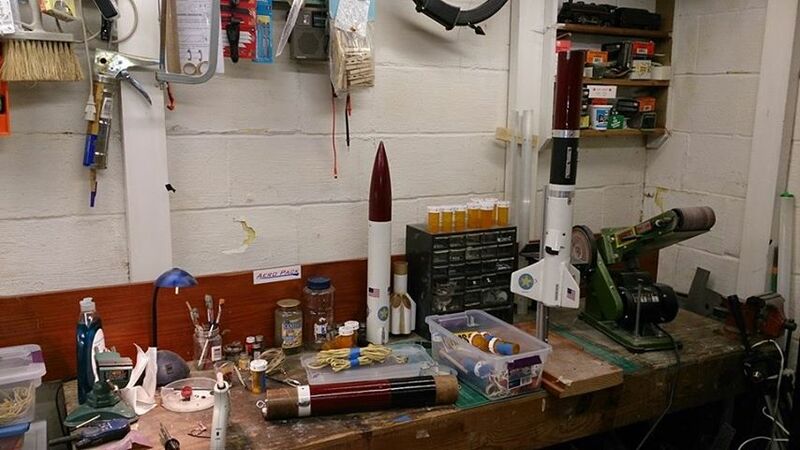 This makes for a great introduction to the rocketry hobby for those who are new to it, or are following along with my adventures from the sidelines. Enjoy!